Fishing began in late August with a Colorado family reunion and ended in southwestern Montana matching the hatch on Madison River to the sounds of bugling elk. We landed to the news that Colorado was experiencing its worst drought in one hundred years. Fortunately we were able to find quality water on the Elk River. However, unbeknownst to us, the fishing area was directly between two forest fires which were quickly closing in. Sue caught her first fish cheered on by fire fighters watching from a ridge above the river. Altogether we caught ten nice rainbows and a few brookies using size eighteen pheasant tails on a dropper before we had enough Smokey the Bear fishing. When I later discussed our rather unusual fishing conditions at the fly shop, they reminded me that they had sent me to this water because I had made the point of not wanting to fish low water where the fish were already stressed. The Chinese proverb about being careful what you wish for came to mind. By the way, normally the tailwater below Stage Coach Lake fishes pretty well. Day Two We had arranged to fish the park with a guide. Believe it or not the guide at Bob Jacklin's said the fishing was not that good and we could cancel if we did not want to go. Not being in the habit of begging guides to take our money, we walked over to Blue Ribbon Flies fly shop. Asked where, how, and what flies we needed and we were off to fish the Madison River between the two lakes. Now as most of you know this is heavy water. We were no match. Just when you think you have things figured out, an osprey dives and plucks a nice fish from the water you declared "dead". We decided to do some sightseeing in the area that supports the highest concentration of wildlife in the lower forty-eight states. Driving up the valley to Ennis, MT we remember a fellow who lives there and does some guiding. He said sure we could all go out in his boat. The Madison in this area is not as steep of a gradient and fishing conditions better matched our skill level. Day Three Time for some exercise and a hike to Slough Creek. A spectacular setting and an excellent cutthroat fishery. For once events went by the book as we sight-fished to large fish with terrestrials along the banks. After the obligatory late afternoon thunderstorm, the hatch was onundefinedand we had the right fly courtesy of good advice from the fly shopundefinedPMD#20 . Back at the car we met up with some folks who were partying on their last night, so we joined the celebration. Another late night drive across the park. Day Four Guided drift boat fishing on the Madison River. We put in at Lyons Bridge with only six other cars in the parking area. Fish in the Madison are incredibly hot fish. It was all we could do to land the ten- to fourteen-inch fish. We never landed anything larger. Half the time we thought we were snagged only to find it was a big brown hunkering down in the fast current using the leverage of the boat quickly drifting away to break off; or an acrobatic rainbow that had a full bag of tricks learned from being caught before. This is a good river to test your skill level. It is hard to explain, but I knew that it was not that we were making mistakes as much as it was we did not yet know what to do. These fish are good. Day Five & Six I'm trying to swing soft hackles when someone politely tells me what I already know by now, "You're wasting your time". It turns out he and his wife live in an RV and have fished YNP for the past twelve years and the Madison Rriver in the park is one of their favorite streams. We fish with them for the better part of two days and we caught fish! We catch them on nymphs, we catch them on terrestrials. This guy knows every hole, water depth of every run, he even designs his own flies, which he generously shared with us. Dale and Sherlee are special people which we now call friends and to whom we made a promise to return and see next summer. Southwest Montana is clearly a special place. 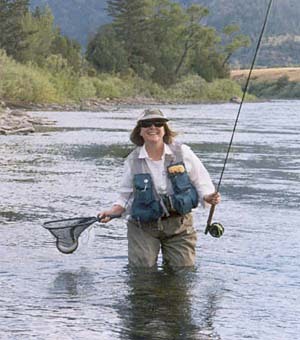 A quieter place to fish, but where the fish are grand and active. Where you see our sport elevated to its highest level. A world class fishery giving everyone room to expand, time to develop a rhythm with the stream, an abundance to cover your mistakes, and a benchmark to judge your personal journey.